The two schools that (almost) share names have a lot in common. Great students. Supportive fans. 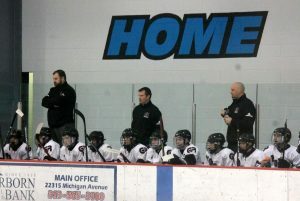 And outstanding hockey teams that met on the ice Wednesday night in Dearborn in a Division 3 state quarterfinal playoff game. And it was only fitting the game would require overtime to decide a winner. Riverview Gabriel Richard and Ann Arbor Father Gabriel Richard-Greenhills squared off in a spirited and well-played game that was tied 2-2 after one period before the boys from Riverview took a 3-2 lead into the final period. FGR-Greenhills evened things up in the third period and both teams had chances to end it in regulation but the game was destined for overtime before the puck even dropped at Dearborn Ice Skating Center. At the 6:29 mark of overtime, Riverview Richard’s Chance DeSana took a pass from Jake Emery and fired a shot from the top of the circle that FGR-Greenhills goalie Riley Noble more than likely never even saw as there was plenty of traffic out front. The shot – and goal – sent the Pioneers to the next round with a thrilling 4-3 overtime win. Riverview Richard (15-10-1) will face Houghton at 11 a.m. on Friday at USA Hockey Arena in Plymouth in a D3 state semifinal game. 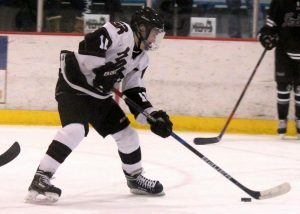 Houghton (22-5-1) defeated Alpena 4-1 in a quarterfinal game in Sault Ste. Marie. The Division 3 state championship game is set for 2:05 p.m. on Saturday, March 9. This will be Riverview Richard’s second consecutive visit to the Final 4 and fourth in the school’s history. The Pioneers lost to Livonia Churchill in a semifinal game 3-1 last year. And this victory was certainly earned. “I thought we played a pretty good game,” said DeSana. “One of the things I said to the guys after the first period was that both teams are here for a reason. They earned their spot here and we earned our spot here. DeSana hopes that effort carries over to Friday morning. That tough schedule included a very tough team from Ann Arbor in the postseason, as FGR-Greenhills (19-8-1) featured some explosive players, a great work ethic and a big heart. They also benefitted from playing a tough schedule throughout the year. In the postseason, the Irish advanced to Wednesday’s quarterfinal with wins in the regional over Allen Park, Chelsea and Cabrini-Annapolis. In an exciting and back-and-forth first period on Wednesday night, FGR-Greenhills opened the scoring at 10:19 when Vincent Vermeulen scored on the power play to make it 1-0. Thacher Groe earned the assist. Riverview Richard came right back to tie the game and then take the lead. With 13:42 left in the first period, Nathan Vazquez scored to even things up at 1-1. Frank Klamerus and Chance DeSana earned the assists. Less than a minute later, the Pioneers were up 2-1, as Austin Harrison lit the lamp for Riverview Richard at 14:05 with assists from Emery and Zach Slowik. But the Irish came back and tied the game right before the first intermission. At 16:13, William Ressler scored for his squad, with an assist from Aidan Brewer, to square things at 2-2. There was only one goal in the second period and it came quickly, as Vazquez netted his second of the night for Riverview Richard, unassisted, at 3:18. The third period continued the emotion and back-and-forth and outstanding play from both teams. The goaltenders, Noble for FGR-Greenhills and Drew Adams for the Pioneers, were both solid throughout the game and took their play to another level in the final period. With 8:19 to play in the game, Brewer scored for FGR-Greenhills and it left the game deadlocked at 3-3. Down the stretch, the Irish actually had to kill two penalties (one with 5:18 left and another with 1:16 remaining) late in the game. Overall, the FGR-Greenhills penalty kill did a good job limiting any great scoring chances. The Irish seemed to have a little spring in their step in overtime and created a few more quality scoring chances. However, FGR-Greenhills was called for tripping and gave the Riverview group the man advantage. And just a few seconds after the penalty, DeSana took his “Chance” and let one fly, sending his team to the Final Four.